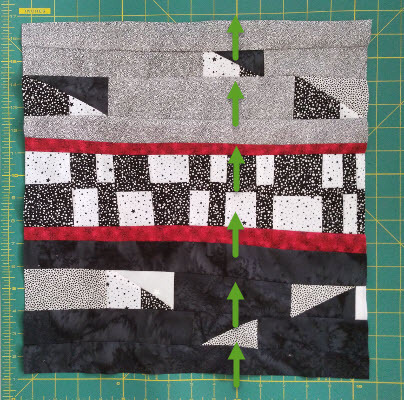 March Stitch Along - week 3 instructions » What's Under the Needle? Start out by giving your block a good press. This is important. Look at your block and assess it. What would you have done differently if you were to start over? Move colors? More/less contrast? Do you ask yourself what if? Make sure you have a photo for reference because we are going to make a change! With your block well pressed, cut it into 9 even squares - but remember, no ruler. So when I say evenly, I mean at a guess. The easiest way to do this is to place the block on your cutting board and use the lines on your board to eyeball from one side to the other - draw an imaginary line with your eye. Then use your rotary cut to make the cut - look at the finish line because more than likely that is where your hand will guide the cutter. By the way, the rotary cutter is easier than the scissors and if you go a little crooked, it won't matter. So if you have a 15" square you should end up with NINE 5" squares or thereabouts. Rearrange your squares and audition them by swapping them around, twisting them, turning them etc, until you find a pleasing result. Each time you move things around take a snap shot of the layout, that way you can review them all on your camera and decide which is best. Once you have found the best layout, join the squares back together. Your square will now measure approximately 14" but it may be smaller if you needed to do any trimming to make the blocks fit back together.